One of the most beautiful natural creations to grace the eye is the vast selection of seashells that ornament the ocean floor. The intricate patterns and brilliant colors that occur with little thought of design by the shell's inhabitants is a marvel of life. Thousands of species abound, some relaxing among the shallows; others wandering in the blackness seven miles below the dancing waves. These wondrous empty domiciles have been collected and coveted for thousands of years, some as money, some as adornments or tools, and others simply as attractive curiosities. 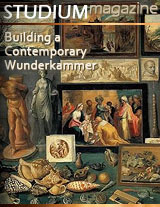 It is also something that has been a part of many wunderkammer, the example under discussion included. Among the five main types of seashells - clam, conch, cone, moon, and whelk, the cone is one of the most popular.and if discovered alive, dangerously poisonous. Noteworthy among these is the renowned 'Glory of the Seas', the Conus gloriamaris. Attractive tan surfaces covered in thin copper geometric patterns accented by bands of light brown, as well as its rarity made this species highly sought after. Discovered in 1777, only a few examples existed, most forever imprisoned in museums, making this the rarest seashell, commanding thousands of dollars for a single example. Madness for shells had struck. In one Amsterdam auction, a Conus gloriamaris sold very near the price of their Vermeer painting, which today would fetch over $30 million. The Glory of the Seas shell rarity would continue to enjoy spirited demand and lofty prices for nearly two centuries. However, with the advent of scuba diving gear and the subsequent 1969 find of the seashell's habitat in the Philippines, the market was flooded with hundreds of impressive examples. The price collapsed, as anyone who wanted one had a large selection from which to choose. Now, one can be added to any collection for $100. Shell collecting or the desire for a single representative example is still a popular pastime. It is also, in this particular case an excellent illustration of the economic power of supply and demand.